The Rosary – Me? A Catholic? Ah, yes, the Rosary. Learning to accept the Rosary has been, and still is, a journey. To my former Protestant way of thinking, it combined several evils…praying to a dead person, praying to someone other than Jesus, using an inantimate object for worship, uselessly repetitious prayer….onandonandon…. I was happy to discover that you did NOT have to pray the Rosary to be a “good” Catholic. This took any pressure I felt off immediately. Then an interesting process began. It was a few years until I began to even want to discover why I should ever pray the Rosary. I think it started with a need to pray, for what, I can not remember. Somewhere I read that the Rosary is just a tool. That the repetition of the “Hail, Mary” is just a tool. The real action happening was behind the scene…in your spirit…as you meditate on the mysteries of Jesus’ life. The “secret” to the Rosary is….It’s All About Jesus!! Imagine that!! So, I was interested. We found a book that had short phrases to pray before you said each Hail, Mary. They were arranged by topics, so that was another depth to the praying. I was walking at that time, and decided to try praying the Rosary as I walked. I discovered that it took me a few decades to get “into” the praying. After that it was a very interesting experience of prayer. My mind would go off on tangents..thinking about family and friends…events in my life…thoughts of Jesus in the Mystery and considering that as if I was “in the mystery”. I thought I was praying Wrong… !! I read somewhere (I wish I could remember all the places that “I read this somewhere”..that might be helpful. sorry..it’s gone) that if you get sidetracked (like I just did) that it is OK!! That you can actually Stop doing the actual Rosary praying and meditate and “talk” with Jesus and God about what has been brought to your mind. Lightbulb!! The Rosary is a Tool to get you praying, so you can have a connection with HIM! Another chapter in my Rosary tale…I discovered that people make Rosaries. It never dawned on me that someone made them. duh But in addition, they made hundreds and thousands to give to the Missions, all over the world. I ordered a kit from Our Lady’s Rosary Makers. It included pliers, wire, beads, and an instruction sheet. I did not know it also included hours of frustration! It took me quite a while to learn how to make the loops, and the chain. Making them the same size, even longer! My husband really made fun of me as I sat there all bent out of shape, loudly expressing my disgust at not being able to learn this, and drinking a beer while doing it! He told me I’d have to say a lot of Rosaries for penance! To date, I’ve made lots of Rosaries…hundreds. I’ve sent some batches overseas. One time I asked a man from my parish if he knew of someone who could use the Rosaries. He did. They were sent to western Kansas! A nun was teaching a group of high school kids, I think for a Confirmation retreat. One boy stayed outside of the group’s activities. When she gave out the Rosaries, she had one left. She went over and talked to him, telling him about it, the color red representing Jesus’ blood. He did take it. Later on, she learned that he was being recruited by a gang, and having the Rosary, and praying, helped him to resist joining that gang! I made one for myself that had six decades in it instead of the normal five. Each represents one of my children and their children. The beads are colored for the month of their birth. So, when I pray with that Rosary, they are included in the intentions and brought into the Mystery. I even included 3 beads for the babies in heaven, Lucia, Edward, and Micah. Now, although I’ve made hundreds of Rosaries, and have had beautiful experiences praying with the Rosary, why do I not pray it very often? I haven’t figured this out. It’s probably partly a habit that I have not formed. Maybe I could make one like this and enlist others to pray with me! Exercising is another option..to combine my walking (what walking??) with praying. I have done this. In the past. Yesterday, I had my daughter help me bring up the treadmill from the basement. It is staring at me everytime I walk past. I did put on my running shoes Ha! Ha! this morning so I have been writing this post instead of walking and praying…so, my excuses have run out. I will go officially log in my First Rosary Mile! See ya later. This entry was posted in Rosary and tagged Making Rosaries, Mary, praying, praying to Mary, rosary, Rosary Miles. Bookmark the permalink. I enjoyed reading your Blog Patrice. It did make me feel better. Also, the part about making rosaries, I’ve done that too! 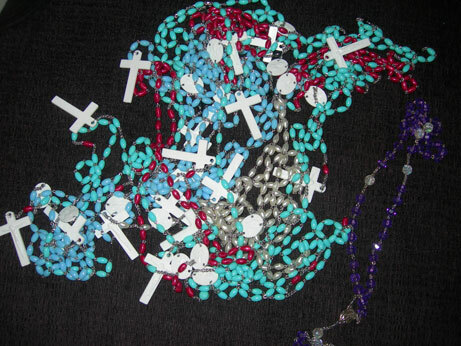 However; the rosaries I made where made out of plain blue plastic beads & thread with knots tied between the beads & I sent them overseas to our troops. I think I need to look into doing that again. Thanks, April. I have some pink plastic bead rosaries right now that I inherited, so to speak. Plus a lot of supplies, too. That may be another blog post on the rosary!! I love this part. I think it is very helpful. Sometimes I get disappointed because I “did not do it right” because I did not finish or I did not meditate on the right mystery for that decade, etc. But really it is all about connecting with the Lord and there is no one real “right way.” Thanks for reminding me. If I could count as “praying” for all the times I get side-tracked!!! Now that would be something! !